Mindfulness meditation is a practice that makes it possible to cultivate and develop certain basic positive human qualities in the same way as other forms of training make it possible to play a musical instrument or acquire any other skill. It can help us to better recognise and understand the dysfunctional aspects of ourselves and to break out of the vicious cycle of negative behaviour patterns. Mindfulness meditation can transform our experience of the world and enable us to better manage in times of stress, anxiety, fear and other negative emotional states. In addition, studies have shown that meditation has beneficial effects on our physical and mental health. For the last ten years, intensive studies on meditation and its long- and short-term effects on the brain have been conducted. Other scientific investigations have shown that you do not have to be a highly trained meditator to benefit from the effects of Mindfulness Meditation. Even 20 minutes of daily practice can contribute significantly to the reduction of stress. It also reduces anxiety, the tendency toward anger and the risk of relapse for people who have previously undergone episodes of serious depression. It has been identified that just eight weeks of mindfulness meditation (of the type known as Mindfulness-Based Stress Reduction, or MBSR) for 30 minutes a day, significantly strengthens the immune system, reinforces positive emotions and the faculty of attention, reduces arterial pressure in those suffering from high blood pressure, and accelerates the healing of psoriasis. By using Mindfulness practice and regular meditation we can train our mind to work in a constructive manner–for example, by replacing obsession with contentment, agitation with calmness, resentment with acceptance or hatred with kindness. Mindfulness meditation can bring significant and lasting functional and structural changes in the brain. Mindfulness, altruism, and other basic human qualities can be cultivated and developed. In general, if we engage repeatedly in Mindfulness practice, modifications in the neuronal system of the brain can be observed within a month. Therefore, it is highly beneficial for our mental and physical well-being to adopt a practice of Mindful Living and to include mindfulness meditation in our practice on a regular basis. What is Mindfulness? I am asked this quite a lot, but one person (whose mind seemed to be saying “hurry up, I don’t have time for this”) recently asked me to define mindfulness in just a few words. They seemed to be in a bit of a rush for an answer so may well have been in a state of ‘mindlessness’ – already preparing to move onto the next task in their mind. So, although they had asked for clarification about what mindfulness is, their mind had already taken them into another dimension ‘the future’. Many live in a constant state of being in the past or future, rather than living in the now. An example of this could be a person washing up the dishes but their mind is drifting on to something that happened earlier in the day or a future event. Or perhaps they are focusing on time “if I don’t hurry up, I’ll miss the start of the TV programme” etc. That person is ‘washing up to watch TV’ etc. They are not mindfully present in washing up, their mind is wandering off elsewhere and it is in control. Mindfulness practice helps us to focus our mind and to engage fully in what we are doing – to become one with life in that very moment, rather than worrying about the past or future. So, let us explore what mindfulness is and why it cannot be defined in just a few words. Phrases like “living in the moment” or “being present” give an initial introduction of what mindfulness is, but asking “What is mindfulness?” is a bit like asking “What is art?” or “What is love?” Fully discovering the depths of mindfulness requires time and exploration. There is a wealth of meaning in the experience of mindfulness that can enrich our lives in unimagined ways. I’d like to share with you my view on what ‘Mindful Living’ (or mindfulness) is with the hope that you may gain something from it to help you to be more focused on ‘living in the now’. I see mindfulness as a way of being. It’s not doing, it’s a way and a quality of being. It’s a way of being in a relationship with yourself. It’s about recognising what’s going on in your body, mind, and heart. It’s how we respond to our circumstances. How we look at them, how we look at others and the outside world. We can define the term mindfulness as paying attention in the present moment, on purpose, non-judgementally. Those two aspects, on purpose and non-judgementally, are key aspects to unblocking our negative thought patterns. Our thinking habits are often the exact opposite, subconscious and judgemental. We can create thousands of negative ways to view our ‘mind storm’ in an instant. So we can be living with constant worry, fear and regret which is a constant stress. This mind talk is about what’s happening inside your head and most waking moments many of us are living in narratives in our minds. Those narratives are very powerful and they impact on the way your entire body works. When we, or someone we love, are hurting, whether the source is illness, a divorce, a break-up, depression, or any other such thing, we can take it upon ourselves to attempt the sometimes impossible task of fixing it – making it ‘as it should be’ in our mind. We spend much of our time thinking of ways to fix, overcome, avoid, etc. but little time in recognising the benefits of truly being in the present moment. This leads us to become very much driven with these goals of things to do, and in doing so we lose ourselves. Mindfulness helps us come back to who we really are and to re-connect with the present moment. ‘Mind how you go’ is something that is often well-meaningly voiced. Perhaps you have had this said to you when you are leaving a friend’s house or setting off on a journey. You may have said this to others. Minding how you go makes sound sense, yet ‘Living Mindfully’ is ironically something the average person does not spend too much time thinking about. We are often too busy trying to schedule our lives to the minute so that we can fit a thousand tasks into one day’s time. I think we can have a tendency to be overly hard on ourselves and our circumstances. Rarely do people fall into the habit of thinking things are actually much better than they are. Mostly we tend to view the difficult circumstances and obstacles in our lives as exactly that; difficult. Some are harder to face and more painful than others. But whatever the circumstance, once negative thoughts enter our mind we can often enter into a spiral of ‘mind chatter’ that takes us down a path of visualising the situation as far worse than it is. Whenever anything difficult or unexpected happens we may feel the initial combination of two things: fear and stress. How can we possibly overcome this incredible stress and still remain intact? I call this ‘our mind storms’ – the explosion of mind talk that fills our head in times of fear and stress. This blocks us from being ‘present and focused’. Instead, we end up focusing on our thoughts and seeing them as reality rather than what they truly are – just thoughts. Even when we are not conscious of it, our mind is often full of ‘mind chatter’ that takes us back and forth from ‘living in the past’ – in resentment or regret about an experience, or ‘living in the future’ – worrying about something that we perceive may happen: Whatever the mind talk is about, it is never about ‘living in the present’. For many, ‘mind talk’ fills our lives. And it’s all an illusion that we frequently mistakenly see as reality. We all have our own mind storms; they are our inner and outer battles and our happiness largely depends on our ability to remain resilient within these. I do not mean don’t grieve or feel, because these are natural human emotions. What I am inviting you to practice is trying to be present, trying to accept your mind talk and the mind storms that you have for what it is and finding some calm within it, rather than trying to overcome or avoid it. For many, finding calm in times of fear and stress can feel impossible. This is where mindfulness can serve us well. Science is showing us that adopting mindful practice helps us to be less fearful and stressed and it helps us respond more wisely. So, what is Mindfulness? I am asked this quite a lot, but one person (whose mind talk may have been “hurry up, you don’t have time for this”) led me to focus my next post (which I have now commenced writing and will post this soon) on ‘What is Mindfulness?’. We are pleased to announce that OPAL has been recognised with an award for excellent customer service by private healthcare search engine, WhatClinic.com, based on feedback by customers over a twelve month period. The OPAL Foundation was honoured with the award due to their fantastic customer feedback and their constant drive to better client experience. OPAL’s founder Ray Sawyer-James today said; “I am absolutely delighted for OPAL to be recognised for our commitment to customer service. As a practice, it is something we focus on in everything we do and to receive such positive feedback from those who use our services is a great endorsement indeed. We are deeply appreciative of such recognition, which we value greatly”. Managing and calming anxiety is not just a one step solution for most people. There are a number of methods that can help to reduce / remove anxiety and I am happy to discuss these more in a further blog if readers feel it may be useful. However, in this posting I am going to share one way that can help. That is the simple act of taking a mindful walk. I am a huge Mindfulness advocate and many (if not all!) of my blogs talk about this. There is a practice in Mindfulness (called Mindfulness Walking) that is a form of ‘walking meditation’. This practice requires you to focus fully on every movement you make. I have adapted this process into a more simple form of practice (that I call ‘Mindful Walking’), which can be used for the purpose calming the mind and connecting with the here and now. Along with ‘Mindful Breathing’, I use this process in my cognitive therapy practice when working with clients who are confronting issues of anxiety and panic attacks. 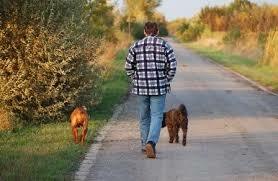 We often view walking as a ‘means to an end’ – to get somewhere, to get fitter, to walk the dog etc. Walking is indeed a good form of exercise, but Mindful walking has the added effect of soothing the mind. 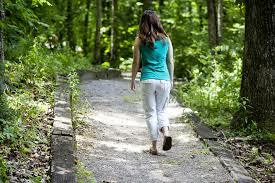 If you are new to Mindful walking, try to find a place you can walk that is away from street noise, people, and has some trees – a place of ‘nature’. The bonus of walking in this type of environment is it can be easier to calm your mind and ‘just be’ when there are less distractions. Don’t fall into the trap of feeling that you can’t do Mindful walking anywhere else though. In truth, you can do this anywhere, but most find a quiet place more beneficial and easier. When you start walking, be concious of your steps and try to ‘connect’ with being in the now. Take in your surroundings, what you see and the sounds you hear. If your mind drifts back to other thoughts, especially things in life that are bothering you, just acknowledge the thought but place no judgement on it. Instead say to yourself “I do not need to give any further attention to this now” and re-connect with your steps and your surroundings. This does take practice and the more Mindful walking you can do, the more likely it is to be of benefit. Try to make it a regular habit (once a day, once a week etc) rather than something you do only when you want to calm anxiety. Mindful walking is a great combination for looking after your body and mind. Your mind seems to open up and your body feels great as well. Don’t be put off by the ‘Mind-Talk’ (as described in another blog here) that your mind may generate. This is a great opportunity for you to work on this and train your mind to be calm. Following the breath (Mindful breathing) and Mindful walking are really effective ways to take back control in life and be more present in the here and now. It is also an escape from the daily grind that allows you to get some fresh air and see nature. Most towns and cities have parks or areas that have some grass and trees and that is a great place for this practice.